This post was written by Igor Kossov. 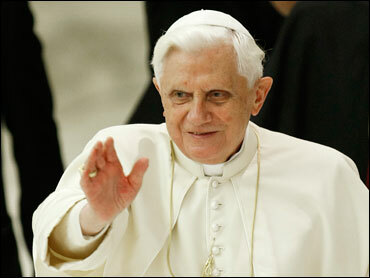 Pope Benedict XVI met with House Speaker Nancy Pelosi, a pro-abortion rights Democrat, at the Vatican Wednesday. Following the 15-minute meeting, the Vatican released a statement calling on Catholic legislators – such as Pelosi – to work to end abortion. "His Holiness took the opportunity to speak of the requirements of the natural moral law and the Church's consistent teaching on the dignity of human life from conception to natural death which enjoin all Catholics, and especially legislators, jurists and those responsible for the common good of society, to work in cooperation with all men and women of good will in creating a just system of laws capable of protecting human life at all stages of its development," the statement said. Catholics on both sides of the abortion debate saw Pelosi's visit as an attempt to legitimize her own brand of Catholicism - "ardent" but pro-abortion rights, The Hill reported. Pope Benedict XVI is a conservative theologian who had called secularization and denial of moral truths "the central problem of the 21st century." He has supported the excommunication of pro-abortion Catholic politicians in Mexico City. Following the meeting, Pelosi did not stress the abortion issue, releasing a statement praising what the church had done "in fighting poverty, hunger, and global warming, as well as the Holy Father's dedication to religious freedom and his upcoming trip and message to Israel." But the pontiff stressed that Catholic doctrine must be accepted without exceptions for abortion and contraception. Pelosi has gotten in trouble with the church before, having said on Meet The Press that the church has been unable to determine where life begins.